Remember the Tsukihoshi rubber shoes I got for my son a year ago? Well, they’re still in good condition even after much use from my active toddler. Unfortunately, he’s outgrown them already. The shoes were true to the Tsukihoshi promise of absolute comfort and support for developing feet. They were so comfortable that they easily became my son’s favorite. Naturally, we’re getting him another Tsukihoshi. His choice this time is the Child 28 Wheel in Black/Blue manufactured with synthetic leather and nylon mesh. The nylon mesh helps ensure that air circulates inside the shoe for added comfort. I also wouldn’t have to worry about my three-year-old being frustrated in his attempt at putting on his own shoes. 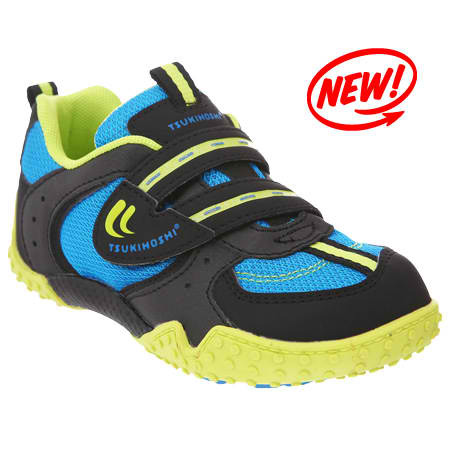 The wide and curved Velcro fasteners make putting on and taking off shoes fast and easy. Wheel also comes in Navy/Gray, Steel/Red, and Royal Blue/Yellow. The Navy/Pink and Steel/Fuchsia color combinations are great for little girls. More than the trendy design, Tsukihoshi boasts of a unique shoe technology that makes it perfect for children who are still growing. The Molded Cup Insoles provide arch support for children’s developing arches while the Flex-Joint Outsoles aid in flexibility especially in the toe area. There’s also plenty of space in the toe area that allow children to more comfortably. Stinky shoes will be unheard of as well with Green-Tea Polyphenols coating the cup insoles. If these features would delight the little ones, this one would win the hearts of moms – Machine Washable. Just follow the care instructions, load the shoes in machine, and air dry them. That’s one less pair to scrub or to dry clean. Don’t be surprised if you hear my son and I both raving about his new “Wheel”. We really do love these Tsukihoshis!